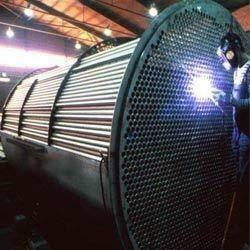 Clients can avail from us quality Heat Exchangers. Our heat exchangers are made from very high quality raw material which ensures high durability at its user end. These heat exchangers are in high demand in the market. We are engaged in offering quality Heat Exchangers. These exchangers are manufactured using high grade raw material following industry standards. The team of highly experienced quality controllers check the whole fabrication process of the Heat Exchangers to maintain consistent standard in the products.